It is no secret that Bed and Breakfasts make some of the best food out there. That is why we created our recipe page; to capture a part of what is great about our Bed and Breakfasts, and share it with travelers. Over the month of April, we asked innkeepers to submit their best recipe, and we received some incredible entries! 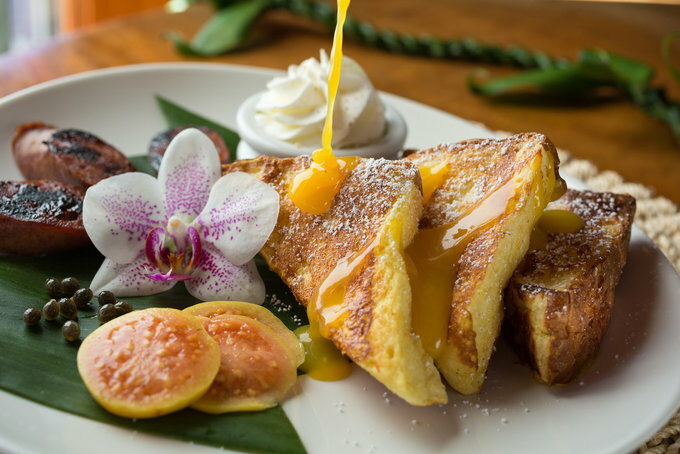 This recipe encompasses what is fantastic about their inn and the aloha spirit: using traditional sweetbread, and passion fruit. From what we hear, it is a guest favorite, and keeps them coming back for more! Slice sweetbread ¼ inch thick, allowing 3 slices per person. Set aside. Blend cream cheese, lilikoi and honey well. You should have a thick consistency. Spread evenly on bread slices creating sandwiches. Slice diagonally. Dip sandwich halves completely yet quickly in batter (sweetbread absorbs very fast). Place on griddle. Lightly brown all sides. Sprinkle lightly with Powder Sugar.